Innisfree's products and I go way back. Between my mom and I, we've tried more than half of their lines. For me, their Green Tea toner and lotion were the first pair from the same line that I loved. 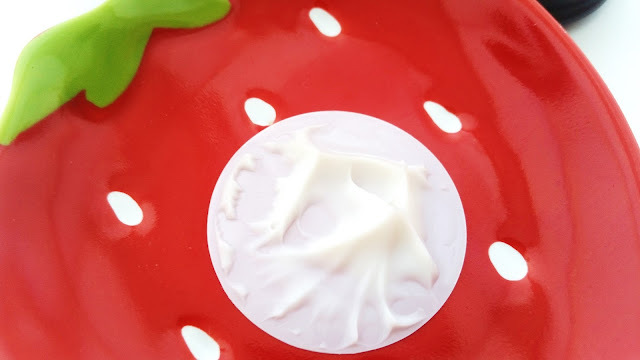 They soothed my skin and provided the right amount of moisture and nourishment to it. Plus, they're inexpensive which was great for my student budget back then. I also like a few of their mists and masks. Can't forget about the No Sebum Powder, which has been my go to for many years. So, it's no surprise that when I found myself having trouble finding the perfect eye cream for the cooler months, I turned to Innisfree. 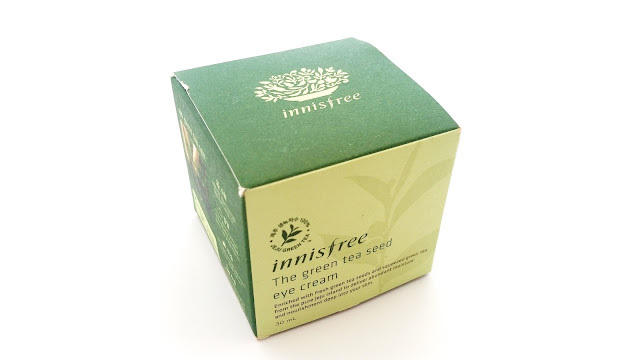 Product Description: Innisfree's Green Tea Seed Eye Cream is a moisturizing antioxidant eye cream. It's formulated with natural Jeju green tea and green tea seeds which is rich in amino acids and minerals. Together with the other ingredients this eye cream will hydrate and nourish the skin, while strengthening its moisture barrier to keep the skin moisturized longer. The eye cream can keep the skin smooth, soft, and supple as well. To Use: Use the ring finger to apply a small amount of eye cream around the eyes. Gently pat it on your skin for best absorption. Ingredients: Camellia Sinensis Leaf Extract (62.9%), Propanediol, Caprylic/Capric Triglyceride, Hydrogenated Poly(C6-14 Olefin), Camellia Sinensis Seed Oil (638mg), Glycerin, Cetyl Ethylhexanoate, Phytosteryl/Behenyl/Octyldodecyl Lauroyl Glutamate, C14-22 Alcohol, Cyclopentasiloxane, Arachidyl Alcohol, Stearic Acid, Glyceryl Stearate, Shea Butter, Grapefruit Extract, Orange Extract, Citrus Aurantium Bergamia Extract, Tangerine Extract, Epigallocatechin Gallate, Camellia Leaf Extract, Prickly Pear Extract, Orchid Extract, Tangerine Peel Extract, 1,2-Hexanediol, C12-20 Alkyl Glucoside, Lauric Acid, Myristic Acid, Behenyl Alcohol, Butylene Glycol, Cyclohexasiloxane, Cetearyl Alcohol, Silica, Arachidyl Glucoside, Ammonium Acryloyldimethyltaurate/VP Copolymer, Ethylhexylglycerin, Ethoxydiglycol, Water, Kaolin, Tocophersolan, Palmitic Acid, Poloxamer235, Poloxamer338, Hydroxypropyl Starch Phosphate, Disodium EDTA, Fragrance. 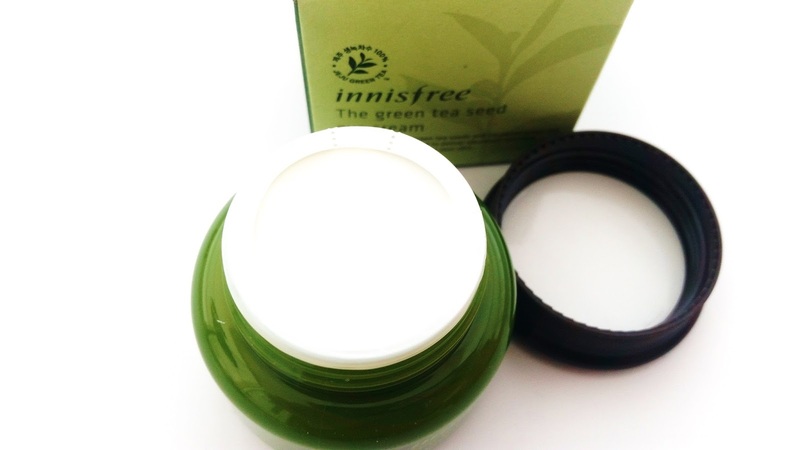 Packaging: Products from Innisfree's Green Tea line are all packaged in green colored boxes and containers. That is no different for this eye cream. The green color gives off a fresh, nature like feel to the product and it goes well with Innisfree's natural green theme. The box packaging contains the product's information and ingredients in both English and Korean. The eye cream comes in a green plastic jar with a black-brown twist-off lid. Inside, there's a plastic wrapper seal (as seen in the picture above) which signifies that this is a new and never opened product. Once you remove the plastic wrapper, you'll find a thin white plastic film (see last picture) that acts the 'inner lid' for the eye cream. Removing that will reveal the rich eye cream inside. Scent: Like most products from Innisfree's Green Tea line, this eye cream has that signature green tea scent. It smells like green tea with some herbal, citrus, and floral notes to it. It's a bit artifical, a bit bitter, the scent is about medium to strong, and it lingers a bit after application. This scent is a hit or miss for most people. Color: The eye cream is white in color. 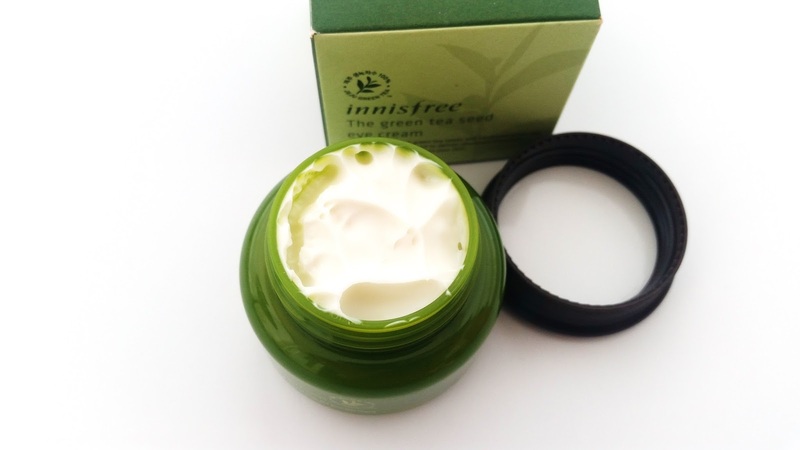 Texture: Innisfree's Green Tea Seed Eye Cream is rich but not heavy. It's creamy but not oily. The eye cream is smooth, easy to apply, and it doesn't leave behind any sticky residues. 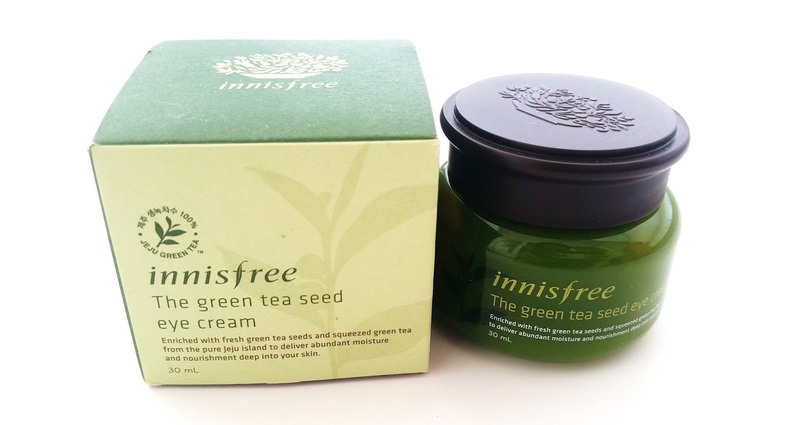 Michelle's Thoughts: As someone who doesn't mind Innisfree's green tea scent in their green tea products, I have to admit, this was a bit strong for me. Don't get me wrong, I like the green tea scent from Innisfree. However, as an eye cream, I found it just a bit too strong for my liking. Especially since it's for the delicate under eye areas, I feel like the scent should have been toned down a bit. Also, unlike other green tea products from the line which has a sweet green tea scent, this one has a bitterness to it that I'm not a fan of. Okay, That's honestly my only con for this eye cream, let's get to the goods! After my unluckyness with my last rich enough for winter eye cream, I was worried that I'd run into the same issues with any rich eye cream I try. Luckily, that's not the case. This Innisfree Green Tea Seed Eye Cream is rich, but I'd say it's not as rich as the last one I tried. Which is perfect for the kind of richness I'm looking for. Despite it being rich, it doesn't feel heavy and absorbs easily. The product doesn't leave behind any oily or sticky residues either. I love that it's moisturizing and softening on the skin. It leaves my under eye areas supple and smooth after use. I generally to use under eye patches to achieve this effect, but it's good to know that my eye cream can do the trick as well. The green tea eye cream also contains an abundance of herbal extracts to nourish the skin and strengthen it. Although not promised, after prolonged use, I've found the eye cream can brighten the under eye areas a little bit as well. Making this a great eye cream for those who wishes to hydrate and nourish their under eye areas, while adding other beneficial skincare effects to the mix. A little goes a long way for this eye cream. I've been using this morning and night for the past 3 months and I'm only 1/3 way through the 30ml container. At this rate, this eye cream will last me 9 whole month! That's a quite a long time. The eye cream only costs $23 too, so that's only about $2.55 per month. This is definitely an inexpensive eye cream and well worth it in my opinion. Finals Thoughts: I like this eye cream a lot. It offers all the basic skincare effects that I'm looking for and it performs them well. Plus, a little goes a long way for this eye cream and it will last me a long time. Making it effective and inexpensive. The only part I wasn't a big fan of is its scent. I found it a bit too strong for the delicate under eye areas. Would I repurchase it in the future? Ah, would Innisfree revamp it to lighten the scent? If they do, I might. Otherwise, I think I'd like to try other eye creams. Although, this is a good one it's not my HG. Looking on the bright side, at least I have something to use in the meantime while I look for my HG. Do I think this is worth a try? Maybe. Do you like Innisfree's green tea scent? If the answer is no, than I think you know the answer. If the answer is yes and this eye cream offers all the skincare benefits you are looking for in an eye cream, than give it a shot! It's definitely worth the bang for your buck. 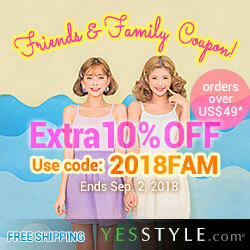 Have you tried Innisfree's eye creams? What are your thoughts on them? Let me know in the comments below!